In bits and spurts through the last three years, we have used copywork. I have never loved it because it wasn’t something the girls enjoyed, though I could understand the theory behind using copywork. We were given a Lifetime Membership to Homeschool Copywork a few weeks ago for this review and it has been a daily hit since then! 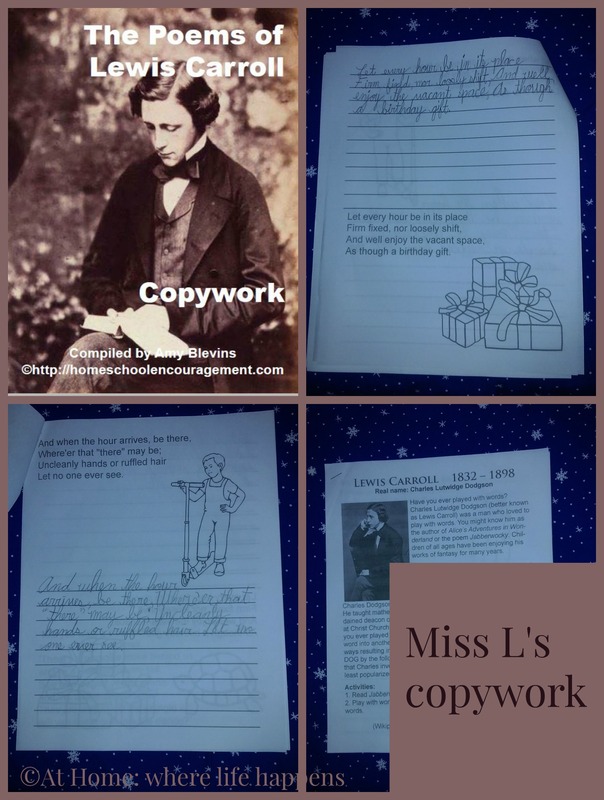 Homeschool Copywork is a family site and is run by Amy, a homeschooling mother who found the value of copywork by using it with her own children. 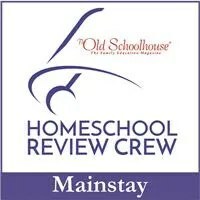 As she grew to understand its value more, she began sharing that with other homeschoolers. And now we all have the benefits of her work at Homeschool Copywork. 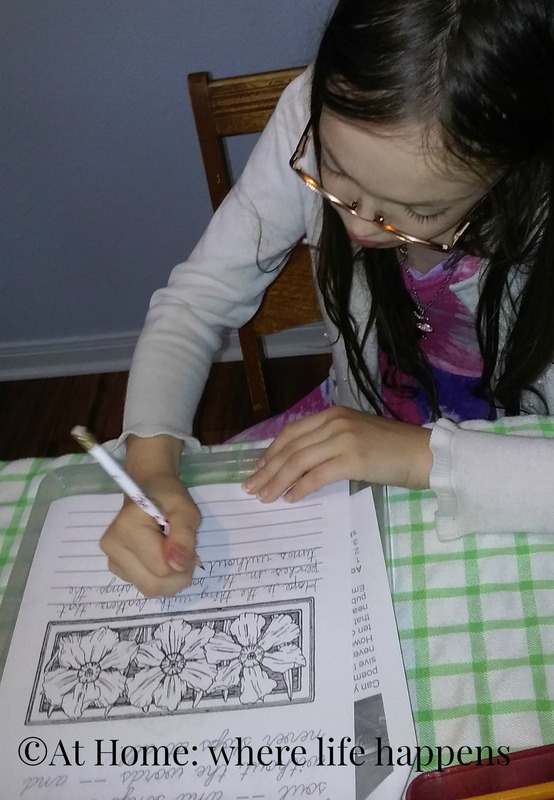 When I opened up the Homeschool Copywork site for the first time, the girls were intrigued. Partly because there was a cover picture for Human Anatomy showing up and that was “gross!” Partly because there was so much of interest for them. Working with the girls one-on-one, each giggly girl got to choose which copywork bundle she would use. Miss L really wanted to do some poetry. There was a lot to choose from and so she had a really hard time! We read quotes from Charlotte Bronte, Emily Dickinson, Elizabeth Barrett Browning, Jane Austen, Lewis Carroll, Henry van Dyke, and a couple of others. There was a lot there. She debated pretty hard but finally chose to start with The Poems of Emily Dickinson as Copywork. We printed the pages in draft form black-and-white (to save on ink). It was perfect. The pages had the poem lines in cursive. Miss L copied them onto single lines using her best cursive writing. Miss L copied one or two poems each day and enjoyed coloring the picture on the page. 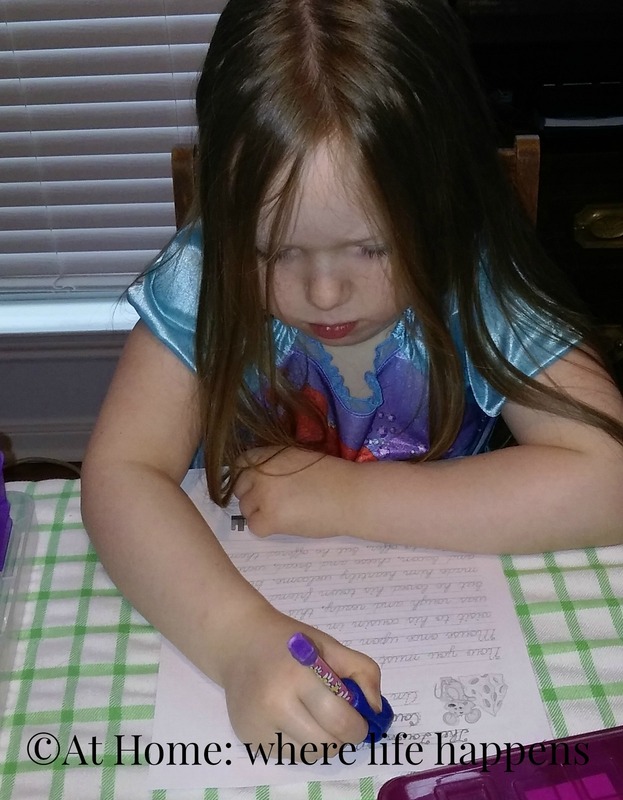 She chose to put it at the beginning of her schoolwork and it really started her off in a happy place each day. After she finished that one, she began work on The Poems of Lewis Carroll. These poems were done the same as the previous ones with a few lines of poetry except we printed these with the print font because it was easier for her to read. She then wrote them in cursive. Miss E had a harder time. She didn’t have any idea where to start. Knowing her pretty well, I chose for her The Dragons of the Bible. Honestly, she grumbled a little bit at the beginning but has come to enjoy them. Of course, coloring the dragon on the page each day helps a bit, I think. It has been pretty interesting to hear the questions she has about the verses and to discuss some of the ideas being shared. That doesn’t happen all that often but she does seem to be enjoying it. While this isn’t the reason to choose copywork, I definitely can see an improvement in her handwriting! Each page had a verse from the Bible that included a reference to a dragon or beast. It also included the citation from the Bible. 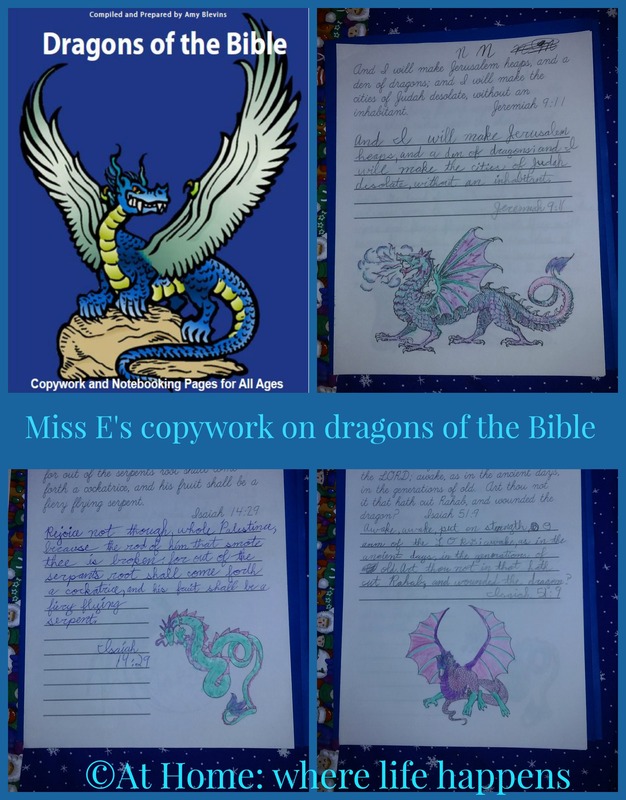 She copies the verse onto single lines on the page and then colored the dragon picture on each page. 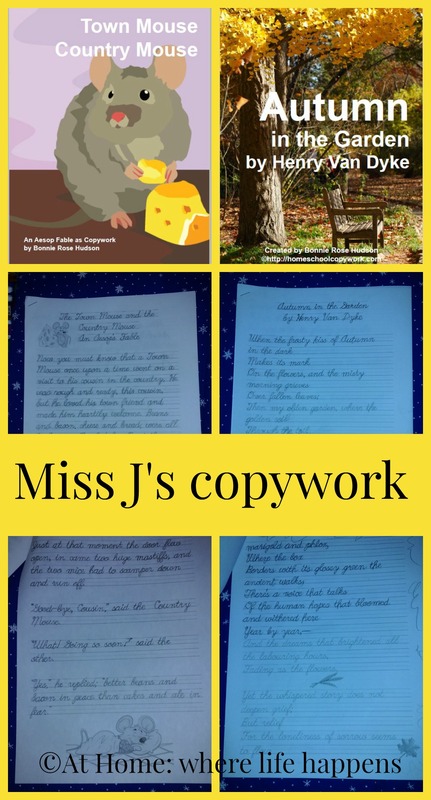 Miss J has been chugging along with her copywork, as well. I gave her a couple of choices but I limited hers. She has been working on learning cursive in an attempt to help her become more consistent with her letter formation and spacing. Therefore, her choices were limited to those with the cursive dotted for tracing. She chose Town Mouse/Country Mouse the first time and Autumn In The Garden after that. I have sat with her for most of her work in order to insure that she is forming the letters correctly. This has been a fun experience for her. As she completes each new section, I will read the story for her but only up to the part that she has completed. This is a great encouragement for her to work hard and do well. I have been pleased with out first all-out copywork experience and am certain that this will continue. Miss L is hoping that more poetry is created before she finishes her work on Lewis Carroll. I would like to see more options with the dotted cursive for tracing. 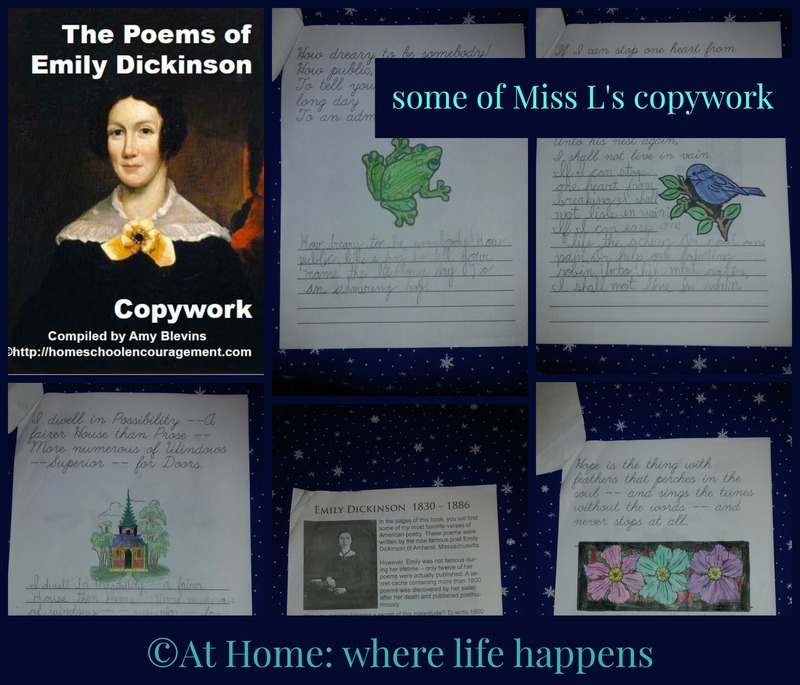 All in all, there is a lot to be found on Homeschool Copywork and I am sure that we will be jumping into some from artists and composers soon. Facebook, Twitter: @AmyBlevins, Pinterest, Google+, and Instagram. Read more review by clicking below.